Located just 5 minutes off of the coastal highway this 3 bedroom, 2 bath home has much to offer. Whether you are looking for a vacation/retirement home, or a potential income producer, this property has it all. With its convenient location, privacy and room to expand, this land lends itself perfectly to a mini retreat with riverfront cabins concept or a B&B model as well. 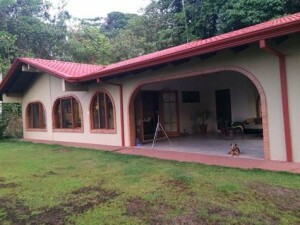 With a fully functioning permaculture system in place (green house, planted root vegetables, over 100 different fruit species, organic greens and regenerating soil support plants) this property is currently producing food and that production will increase exponentially within the next 2 to 4 years. Another feature to this property is the forest that sits right next to the house. Every day there is a live “nature show.” You never now what you are going to see… monkeys, toucans, parrots, pizotes and a whole plethora of other wild animals are on the cast of characters. A short walk through the forest and you are in your own private river experience. Truly amazing “Avatar” trees and clean crystal clear water adorn the river. Owning a home with both an ocean view and an amazing river that you can swim in is everyone’s dream and hard to come by. This home has both!!! !